Jackpots in a Flash Casino is part of The Palace Group of online casinos. They are licensed by the Lotteries and Gaming Authority of Malta and display the eCOGRA seal of approval for safe and fair gaming. The casino offers a good variety of flash games, 24/7 customer service support and a loyalty program with four tiers. True to their name, they offer a number of progressive jackpots. Jackpots in a Flash Casino is powered by the online casino software provider, Microgaming. 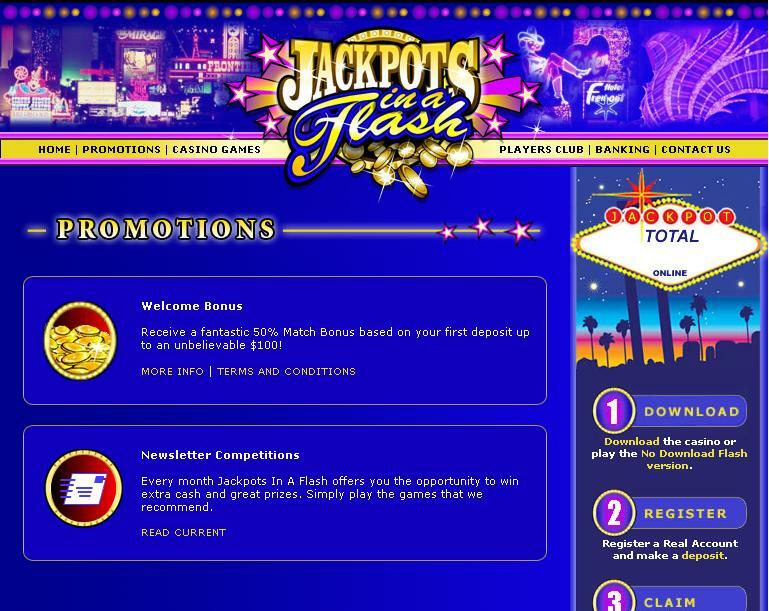 As the name implies, Jackpots in a Flash Casino is an instant flash casino with no download option. They offer a comprehensive suite of games with more than 190 casino games for you to choose from. There are more than 70 slots games to choose from and more than 10 progressive jackpot games. Other games include table games, card games, video poker and specialty games. Video poker games include single hand video poker, 4 play power poker and 10 play power poker. Other games include blackjack, roulette, baccarat, poker and plenty more. 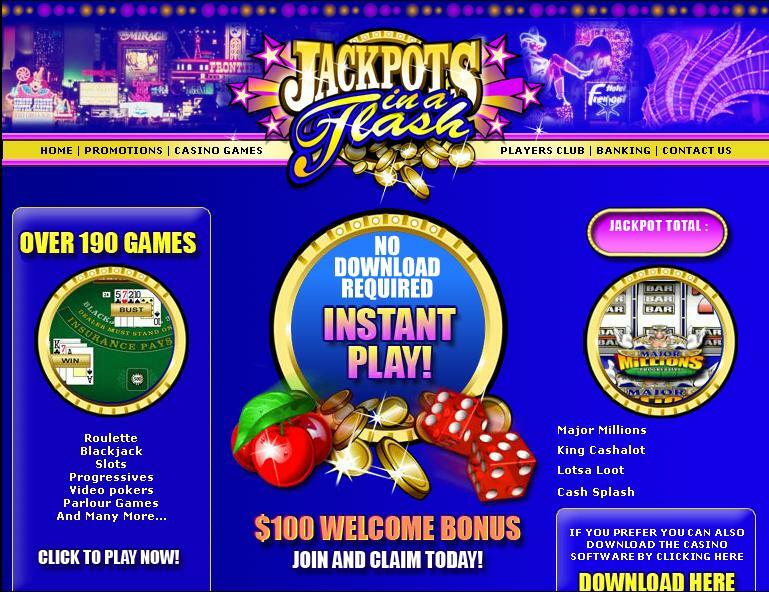 New players at Jackpots in a Flash Casino are eligible for a welcome bonus of a 50% deposit bonus up to $100. New players are awarded 500 free club points to get you started in the loyalty club points program. Other than that, every month at Jackpots in a Flash Casino you are given the opportunity to win extra cash and prizes in their newsletter competitions. To keep up to date with the most current newsletter promotions, you must subscribe to the newsletter. Currently, in May 2010, players can take part in the $2,000 Ultimate Poker Contest, the $2,000 Bonus Slot Bonanza or the $2,000 Progressive Table Party. Players are able to join The Palace Group Loyalty Club. As a member of the loyalty club, you are able to earn club points with every $10 you wager. These points can be accumulated and once enough points have been accumulated you can convert them into casino credits. There are four tiers in the loyalty program – blue, silver, gold and platinum. The higher you move in the program, the more club points you earn and the more bonus points you will be awarded. You move up in the program depending on how many club points you have. If you have any questions when playing at Jackpots in a Flash Casino you can contact their customer service team who are available 24 hours a day, seven days a week, 365 days a year. They can be contact via email, telephone or instant live chat. If you prefer a more independent approach you can access their FAQ section on their website which contains the answers to many general questions. Players can make deposits into their Jackpots in a Flash Casino account via a number of safe and convenient methods. These include credit cards, Switch, Solo, eCheck, InstaDebit, Click2Pay, NETeller, Citadel, Eco Card, Moneybookers, UseMyBank, Delta, Ukash and Paysafe Card.